Anna University is one among the reputed universities in the state of Tamil Nadu catering education to the aspirants since 1978. The university offers undergraduate, postgraduate and doctoral programs in various domains. 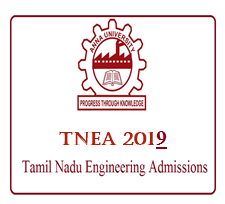 Anna University conducts an entrance test in the name TNEA abbreviated as Tamil Nadu Engineering Admission Test to check the eligibility of the candidate’s willing to seek admission in engineering domain. TNEA is a national level entrance examination in which more than 1.5 lakhs of students participate every year to get place in more than 500 engineering institutes. The details regarding the entrance examination is mentioned in the below article. The schedule of TNEA examination will be announced by the Anna University admission authorities. The application form for the same will be released on 3rd of May 2019. Candidates willing to apply for the exam should have a regular check on the schedules. Tamil Nadu Engineering Admission Exam has set certain criteria for the students to get eligible for appearing the entrance examination. Candidates need to fulfill the eligibility criteria for being considered for admission to any of the participating institutes of TNEA. Age: Candidates appearing for TNEA should be of age not more than 26 years. Qualification: Candidates should have completed 12th/intermediate from a recognized board. Required Score: Candidates should minimum attain 50% aggregate for general category and 45% for reserved category candidates in mandatory subjects like Physics, Chemistry and Mathematics. The minimum weight of the candidate should be 48 kg and minimum height should be 157cms. Candidates should be physically fit and a normal color vision. Those candidates who qualify for admission need to provide the original and a photocopy of the documents. Practices like rounding of marks and normalized marks will not be considered for eligibility. Candidates who have cleared their 12th grades from outside the state must attach a Nativity Certificate only in electronic form/digitally signed e-Certificate to fulfill the eligibility criteria. Application Form for TNEA will be released in the month of May 2019 through online mode from the official website. Candidates will have to take the printout of the application form and carry it to the TFC for verification. Visit TNEA official website and click on Online Application link. Click on the Next option after reading the guidelines. Enter the mandatory details and click on Register option. Click on OK button on the popped up validation box. Login with the Enter email Id, password and verification code. After making the payment and click on Generate Application and Confirm option. Take the print out of the same for further reference. Other State Candidates Application Form: Registration for the other state candidates except Tamil Nadu will be in the month of June 2019. The application procedure will be the same for all the candidates except for the date. Fee Payment: Payment can be made through online mode and offline mode. For online mode candidates can make payment through net banking/debit card/credit card and for offline mode via demand draft from a nationalized bank. The admission authorities of TNEA 2019 will declare the result in the month of June 2019. The result will be declared through the official website. The admission will be based on the sore attained in the Tamil Nadu Engineering Admission Entrance Exam. Visit TNEA official website and navigate to Check Results. Login with the login Id and Password. Take the printout of the score card for further use. Counseling for the TNEA Entrance Examination will be started soon after the declaration of results. Candidates with an appropriate score in TNEA will be eligibility to attend the counseling process and the seat will be allotted based on the merit rank. Special Counseling: For the candidates seeking admission through various quotas such as Sports quota, Differently Abled and Ex-Serviceman children. General Counseling: Candidates applied for the counseling through general category i.e. regular counseling, comes under general counseling. Counseling Fee: Candidates applying for counseling process will have to make the payment of INR 5000/- (in case of general category) and INR 1000/- (in case of reserved category) as an initial deposit through net banking/credit card/debit card by using TNEA official website. Analysis of the application form. Counseling via a single window. All the above mentioned documents should be carried to the TNEA Facilitation Center (TFC) for the verification process. Candidates should carry the original documents along with the photocopy for verification. Random numbers are been allocated to the candidates by the university after analyzing the eligibility of the candidates. Random number serves as a unique code used in tie-breaking policy. It is a 10 digit unique number allocated to the candidates to resolve the conflict in case any two or more candidates attain the same rank. Rank list of TNEA will be prepared by the admission authorities of Anna University, taking into consideration the scores obtained in Mathematics, Physics and Chemistry. The rank list will be made available in the month of June 2019 for those candidates, who have successfully completed the online registration process. The admission authorities of Anna University, allocates the seats for the candidates based on the merit list. The foremost priority will be given to the Tamil Nadu candidates than the other state candidates. The choice opted by the candidates will be taken into consideration during seat allotment, and once the seat is allocated candidates will have to make the fee payment. Anna University has established approximately 42 TNEA Facilitation center to conduct document verification, seat allotment and counseling. University College of Engineering, Kathankudikadu, Ariyalur – 621 704. Ramanujan Computing Centre, Anna university, Guindy, Chennai – 600 025. Government College of Technology, Coimbatore – 641 013. Anna University Regional Campus, Coimbatore – 641 046. Coimbatore Institute of Technology, Coimbatore – 641 014. University College of Engineering, Panikkankuppam, Panruti – 607 106. Faculty of Engineering and Technology, Annamalai University, Chidambaram – 608 001. University College of Engineering, Mangarai pirivu, Dindigul – 624 622. Government College of Engineering, Chettikarai P.O., Dharmapuri – 636 704. Institute of Road and Transport Technology, Suriyam Palayam, Erode – 638 316. Government Polytechnic College, Perundurai – 638 053. University College of Engineering, Kanchipuram – 631 552. MIT Campus, Anna University, Chrompet, Chennai – 600 044. University College of Engineering, Konam, Nagercoil – 629 004. Government College of Engineering, Madepalli, Bargur – 635 104. Government Arts College, Bharathidasan Nagar Road, Thanthonimalai, Karur – 639 005. Anna University Regional Campus, Madurai – 625 019. Thiagarajar College of Engineering, Thiruparankundram, Madurai – 625 015. Thiruvalluvar Government Arts College ,Andagalore Post, Rasipuram, Namakkal– 637 401. University College of Engineering, Thirukkuvalai, Nagapattinam – 610 204. Government Polytechnic College, Keelakanavai, Perambalur – 621 104.